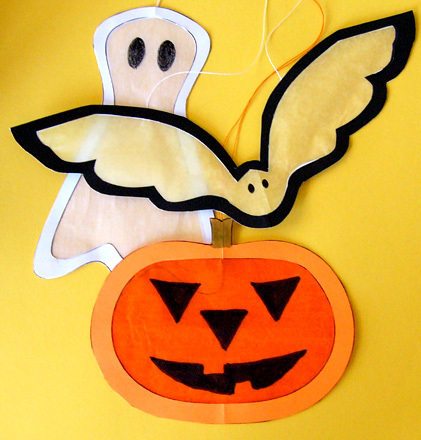 Use the patterns in this project to make Halloween suncatchers shaped like bats, ghosts and jack-o'-lanterns. Hang the suncatchers in your windows and give some as gifts. Suncatchers are easy to make and are a great vehicle for creativity—make them in a variety of colors, and add your own special touches. You can get as much enjoyment from making suncatchers as from looking at them. Tip: The spider suncatchers are a bit more difficult to make. It's best to make one of the other suncatchers first to gain experience. Optional: Waxed paper, cellophane or parchment paper. Choose a suncatcher to make. Download and print the pattern. 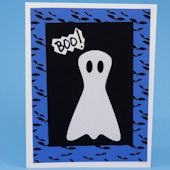 Choose a ghost, bat, jack-o'-lantern or spider pattern that prints in color, or select the black & white pattern and use your creativity to add color and designs. 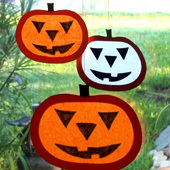 Each suncatcher requires a front and a back, so print two copies of the pattern to make the bats, assorted Halloween or the large jack-o'-lantern. 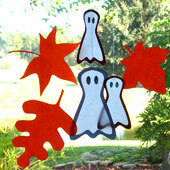 You only need to print a single copy of the ghosts and spiders patterns, since they already include two copies of each suncatcher. 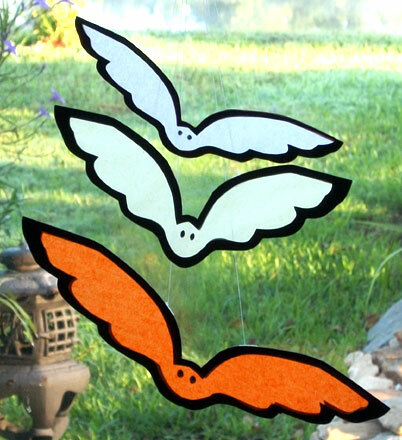 Print the leaf pattern to colored paper to make leaf-shaped decorations to hang in the windows with the suncatchers. Cut out on the box outline around the suncatcher. You need two frame patterns for each suncatcher. Fold each rectangle in half on the dashed line. Cut out the centers of the frames. Now, open each piece flat. Trim the cut edges, if needed. Tip: If your decorations aren't being hung in a window, skip the tissue paper and leave the center uncut. 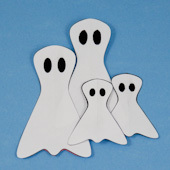 Tip: Save the center cutouts to use as decorations around the house, or on greeting cards and gifts. Color the suncatcher frames, or leave them white. 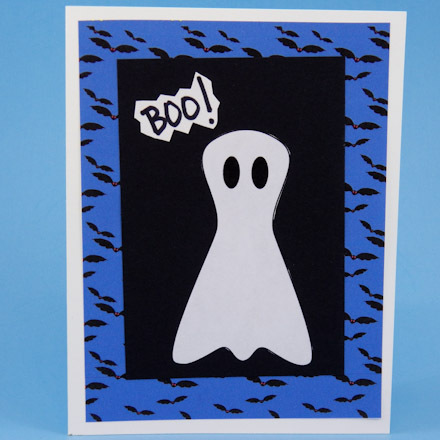 You could draw dots or maybe wavy lines in Halloween colors—use your imagination! Cut a piece of tissue paper about the size of the rectangle. Use white or colored tissue paper. You might also use waxed paper, cellophane, parchment paper or vellum. Spider Suncatcher: Cut an oval using the tissue pattern pattern as a guide. Place the tissue paper over the tissue pattern, trace and then cut. Glue the tissue paper to the back of a suncatcher frame. Glue another frame on top — back sides together. Carefully align the two frames. A glue stick works well. Cut out the suncatcher, trimming away excess paper and tissue paper. You can add decorations to your suncatcher, if you like. 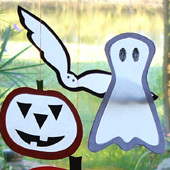 How about gluing eye cutouts on the ghosts, spiders and bats, or eye, nose, and mouth cutouts on the jack-o'-lantern? You can also use a black marker to make the eyes, nose and mouth; just trace over the features on the center cutouts from Step 2. Decide how you want to use your suncatcher. You may or may not want to add a hanger. To make a simple hanger, tape a loop of string or yarn to the top of the suncatcher. 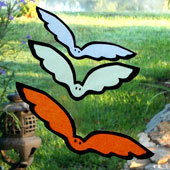 On the bat suncatchers, tape one end of the string to each wing. That's it! Your suncatchers are ready to hang! Project extra: Add some fall leaves to your windows. Print Aunt Annie's Leaf Pattern on colored paper, cut out the leaves, and tape thread or string hangers to the back. 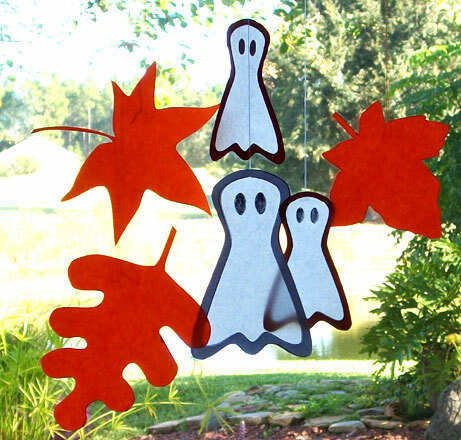 Or to make leaves from construction paper, print the Leaf Templates pattern on cardstock and cut out the templates. Trace a template on the folded edge of red, orange, yellow, brown or green construction paper and cut out. View the Valentine Suncatchers project to see several ways to decorate and use suncatchers and check out the Easter Suncatchers project for more suncatcher patterns to print. 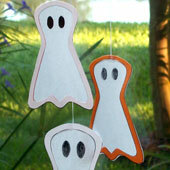 Tip: Use markers to draw spooky eyes on the ghost suncatchers. 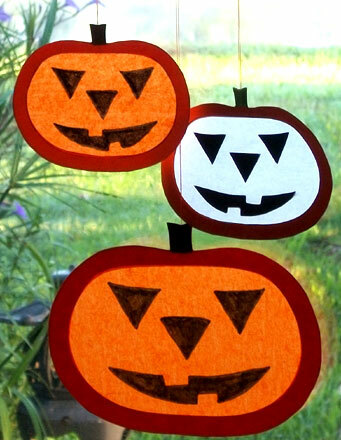 Tip: Use markers or cutouts to make a jack-o'-lantern's eyes, nose and mouth. 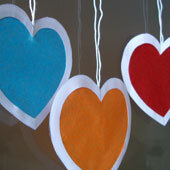 Tip: Use colored tissue paper to make suncatchers. 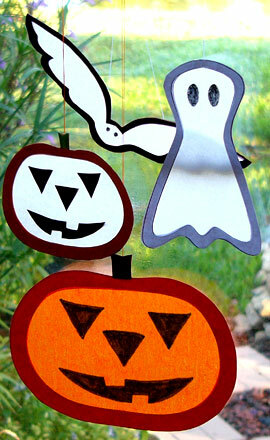 Tip: Use the Halloween Assortment ePaper with suncatcher cutouts to make quick greeting cards. 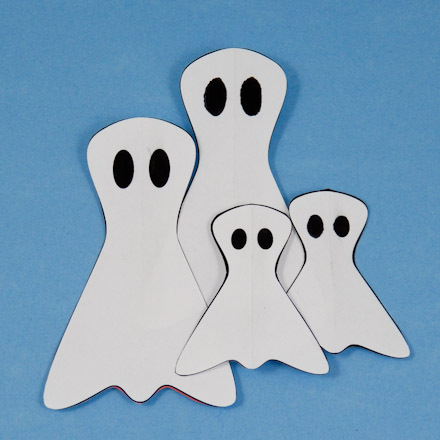 This ePaper features designs from Aunt Annie's other Halloween ePapers and Ghostly Ghosts ePapers. 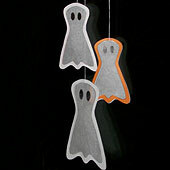 Tip: Suncatchers hung in a window look great at night, too.